Finely ground blue corn flour for making tortillas. An essential ingredient in Mexican cuisine, this nixtamalized corn flour is most often used for making corn tortillas. 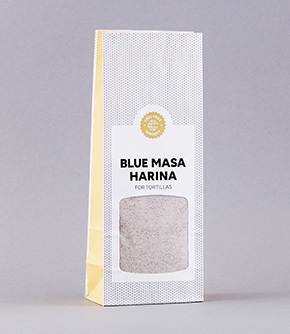 Add 250g masa harina to a bowl and mix in ½ tsp salt. Make a well and add 320ml hot water, mixing together to form a dough. Cover and leave to sit for 20 minutes. Press the dough: if it cracks, add more water, a tablespoon at a time until it is soft but not sticky. Divide the dough into 20 approximately 30g balls. Heat a dry frying pan over a medium high heat. Line a tortilla press with cut squares of a clean plastic food/freezer bag, and gently press a ball into a 12cm round. Peel off the plastic on both sides and gently lower the tortilla into the pan. Cook for about 20 seconds or until the tortilla releases itself. Flip the tortilla and cook for another 20-30 seconds, then flip again – the tortilla should puff up. Repeat until all the balls are pressed and cooked. Keep cooked tortillas warm by wrapping them in a clean tea towel as you make the rest. May contain traces of nuts + sesame. Finely ground white corn flour for making tortillas.An essential ingredient in Mexican cuisine, this nixtamalized corn flour is most often used for making corn tortillas.